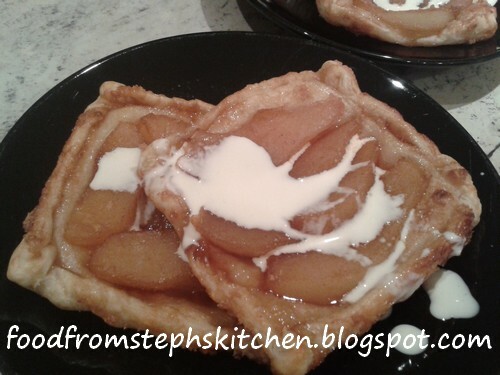 Quick and easy pear tarts on puff pastry. This little tarts are the exact reason why I always keep puff pastry sheets in my freezer! I'm always the type of person who is sitting watching TV and in an instant wants dessert, so I need something quick that isn't too much effort. These are great because if you don't have pears you can use apples, or even peaches. Plus I use canned fruit so you don't have to "plan ahead" and have anything in the fridge, just have a tin in the pantry waiting to be made into something delicious. The best part is the brown sugar that you add on top; it makes this yummy, sticky caramel over the fruit. Be careful not to accidently get the caramel on your fingers when you are getting them hot off the tray! The caramel will stick to your fingers and burn like crazy (like hot toffee does). Any burns aside, this is a delicious easy dessert that I recommend you try. Makes four small tarts to serve with cream or icecream. Best served hot while the pastry is still crispy! Cut your puff pastry into quarters, making four squares. Fold up the edges of each side slightly, I'm talking folding no more than 1 cm. This will create a little wall for your tart. Press down on it slightly so that it sticks to the sides. You could put a little bit of water around the edges first, as it will be better - but I'll admit I'm usually too lazy! Line a baking tray with baking paper so that you don't have sticky caramel to scrub off it later ... trust me, it's not fun! Place each little puff pastry square onto the tray. Next open your tin of pears. If the slices are too big like some of mine were simply cut them in half long ways. 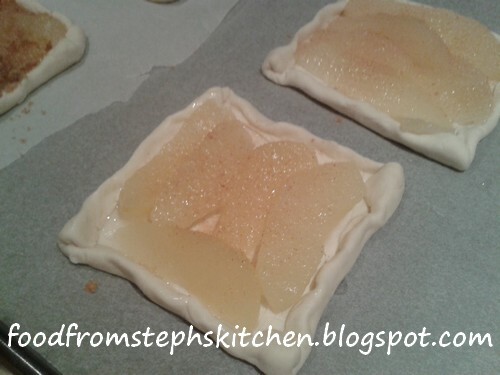 Arrange the pear halves on top on the pastry, making sure that there isn't too many gaps. You really want the pears to cover the inside of the pastry (inside of the little walls that you created). Then sprinkle a small tablespoon of brown sugar over the pears. I found that you don't need a full Tbsp, that a little less is perfect; using a tablespoon measurement simply makes things easier. Finally sprinkle a little cinnamon over the top. Bake in a 200 C oven for about 15-20 mins until the brown sugar has created this sticky looking caramel on top. Serve while hot with a drizzle of thickened cream or a scoop of icecream.